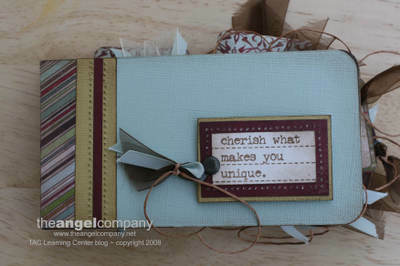 This is a snapshot of the AWESOME Life Thoughts Mini Album Class Debbie will be teaching at the upcoming Great American Scrapbook Conventions. Here is one of the inside pages ... of course the cover isn't attached yet! I LOVE this project and YES! It is featured in our Fall Inspiration Book! If you won't make it to the Great American Scrapbook Convention don't worry ... ask your Angel about it and schedule your own mini album class! And just in time for the holidays!